I saw the Court Pomp and Royal Ceremony exhibition at Versailles on its closing day last June and would have hated to miss it. My expectations were very high, and yet I could not help being somewhat disappointed, not by the quality of the objects on display, which were magnificent, but by their scarcity. I should have known better, of course: how many 18th century court costumes could have survived till the 21st century? Interestingly, the few that did have been preserved in the royal collections of northern Europe, for instance the coronation gown(below) of Queen Sofia Magdelena of Sweden. It was made in Paris of silver cloth, and consists, like all French court gowns, in three separate pieces: bodice, skirt and train. Indeed in the course of the 18th century all European courts had adopted the Versailles court costume. Note the width of the panniers: 3 meters (12 feet!) The depth is no more than 2 feet, which gives the gown the shape of a very elongated oval. 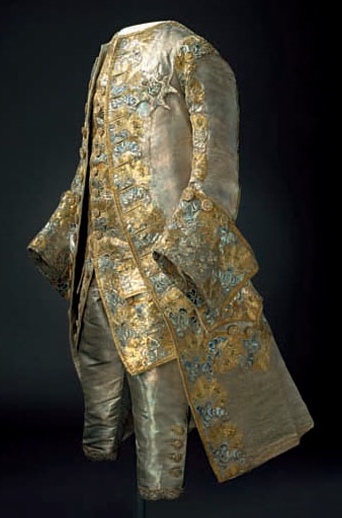 The shape of the 18th century court costume, for men and women, originated at Versailles during the last decades of the reign of Louis XIV, and remained unchanged until the Revolution. It does not mean that court attire was immune to the dictates of fashion: fabrics, colors, ribbons and other decorative elements varied over time. But the cut of the garments was immutable. Court costume was highly codified. Wearing a court gown was a privilege reserved for the Queen, the princesses of the royal blood and “presented” ladies. I have written a prior post on the preparations of dressing for Court. Wearing a court gown was mandatory for all ladies entitled to it, even for the Queen herself, on every formal occasion. The only acceptable excuse was an advanced pregnancy, obviously incompatible with the close-fitting shape of the bodice and the underlying grand corps (a special corset) that covered the entire abdomen. Marie-Antoinette once apologized to the Venetian ambassador, who had come to Versailles to present his letters of accreditation, for not wearing a court gown on account of her pregnancy. If she had not done so, her wearing “regular” clothes on such an occasion would have been construed as a grave slight, and created a diplomatic incident. Court dress was no simple fashion matter. The male court costume may have been more comfortable, but it was no less elaborate than its female counterpart. The King, princes of the royal blood and courtiers wore a three-part costume (breeches, waistcoat, coat) of embroidered fabrics, enriched with diamond buttons, decorations and trim. See for exemple the wedding clothes (left) of the Crown Prince of Sweden, future King Gustaf III: gold cloth embroidered in gold, blue and red thread. The Swedish Ambassador to France, Count Creutz, had been entrusted with checking the latest fashions and ordering the best money could buy in Paris. The Ambassador gravely reported to Stockholm that velvet, after being all the rage the previous spring, was now hopelessly passé. In any case, judging by the quality of the result, Count Creutz acquitted himself very well of his delicate mission. Indeed for State occasions, European sovereigns ordered all ceremonial clothes from France. Such attire was so ruinous that King Frederic III of Denmark had to levy a special tax, known as the “Princesses’ Tax” to pay for his daughters’ Parisian wedding clothes. 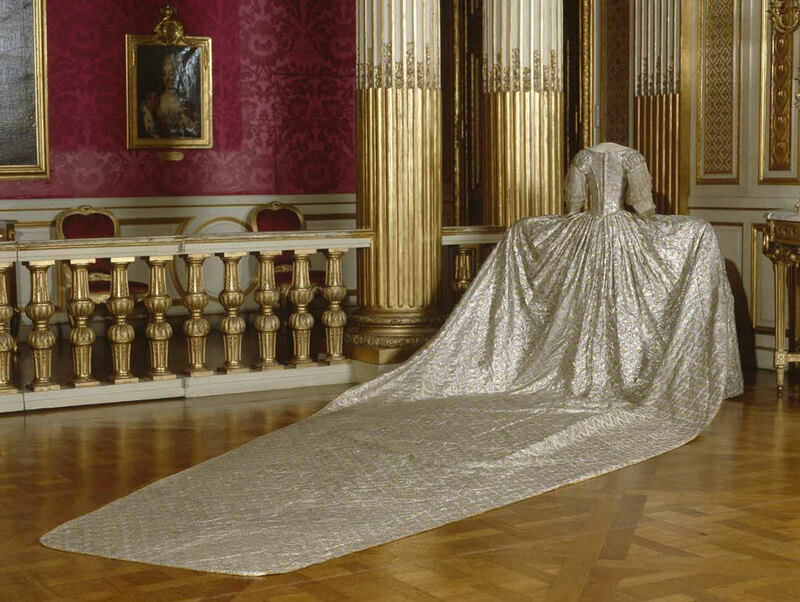 One of the most beautiful pieces on display at Versailles was this shimmering wedding dress (below) of Edwige Elisabeth Charlotte, Princess of Holstein-Gottorp, who married into the Swedish royal family. The fineness of the silver lace on silver cloth creates a garment of ethereal beauty in spite of its bulk. Note the extreme thinness of the waist. The sleeves, which would have been made of rows of matching lace, are unfortunately missing. I can only guess they were reused by another Swedish princess. This makes the comparison between these 18th century court gowns, in their pristine, unadulterated condition, with the famous “Marie-Antoinette” dress from the Royal Ontario Museum in Toronto (below) all the more striking. Here the skirt was altered to fit a round 19th century crinoline, and the plain ivory silk of the bodice does not match the exquisite embroidery work of the skirt and train. 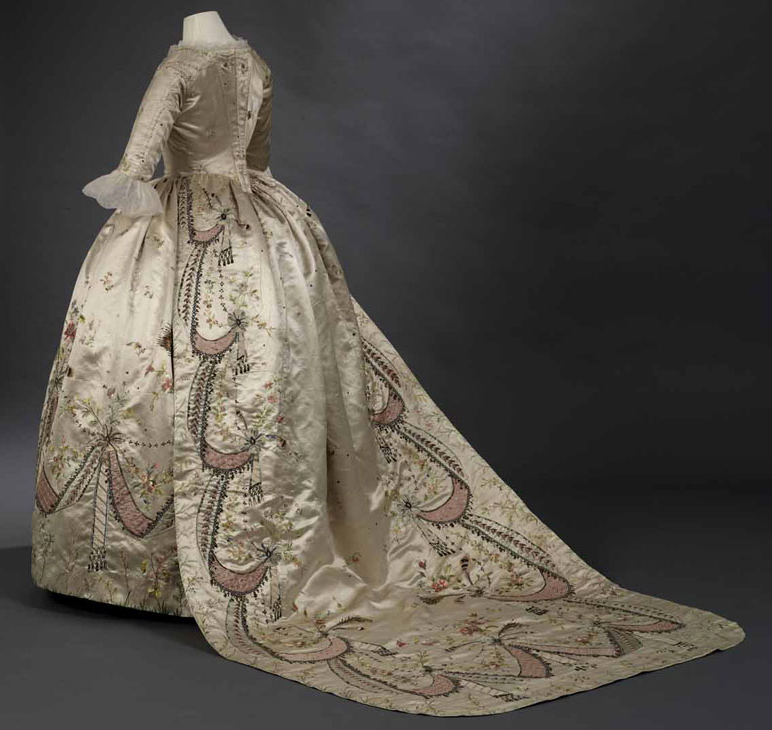 It should be noted that the Toronto gown was simply presented as “attributed to Rose Bertin” without any mention of prior ownership by Marie-Antoinette. I can only assume that such claim was not established to the satisfaction of the show’s curators. After visiting the show, I purchased the (very highly recommended) Connaissance des Arts special issue dedicated to it, and read therein an interview of Pascale Gorguet Ballesteros, Chief Curator of the Musee Galliera, and co-curator of the exhibition. When asked whether Marie-Antoinette’s taste in fashions was copied at Court and beyond, Ms. Gorguet Ballesteros explained that the Queen was the the “number one fashion model” in France and greatly contributed to the success of the fashions she liked. 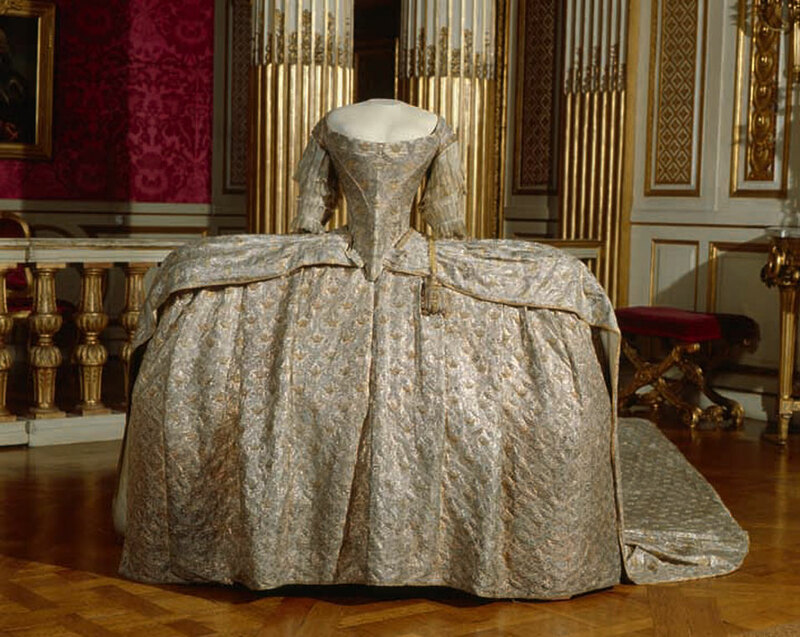 But Marie-Antoinette did not “invent” any distinct style of dress. She launched nothing, she simply adopted some of the fashions available at the time. Especially as a young woman, the Queen loved clothes, and other ladies tended to follow her taste. It was the Duchesse d’Orléans, then Duchesse de Chartres, who introduced her to the famous dressmaker Rose Bertin in 1774, as, incidentally, she also introduced her to Madame Vigée-Lebrun. “Marie-Antoinette,” says Ms. Gorguet Ballesteros, “sits at the border of two worlds, the sclerotic world of the Court and the world of fashion, where one is led to believe that one is going to express one’s individuality. But she has the misfortune of being of being the Queen.” When she sat for Madame Vigée-Lebrun “en gaulle,” in a simple white muslin dress, she created a scandal. Marie-Antoinette was never forgiven for abandoning the traditional court costume in what may now be the most famous of her portraits. See also Court costume: the male side.